ECC has recognised the importance of the fifth generation of mobile technology referred to as ‘5G’ (also known as IMT-2020). 5G is listed as one of the major topics in the ECC strategic plan for 2015- 2020. Regulators, standards bodies, industry and academia are currently discussing 5G and working to develop it further. 5G aims to provide seamless coverage, high data rate, low latency, low power and highly reliable communications. Use cases under consideration include enhanced mobile broadband, massive machine type communications (M2M) ,Internet of Things (IoT), healthcare, home automation, industrial automation and sensors. Vertical dimension will be added from the user’s perspective. Different players from various ‘vertical’ domains (i.e. different industry branches) can be brought together using the 5G ‘slicing’ concept. The network capabilities are intended to match the requirements of the different vertical players. The 43rd ECC Plenary meeting in Prague, 15-18 November 2016, approved a comprehensive list of actions regarding the fifth generation of mobile technology (5G) named the CEPT roadmap for 5G. The latest version of the roadmap includes the updates adopted during the 50th (5-8 March 2019) ECC Plenary meeting to reflect the progress of ECC activities. It outlines the CEPT’s actions for 5G, taking into account the views from all stakeholders expressed during the CEPT Workshop on 5G from 2-4 November 2016 in Mainz. The roadmap outlines the main targets to be addressed by CEPT regarding harmonisation of spectrum for 5G, preparation for WRC-19 agenda item 1.13 regarding IMT above 24 GHz, consideration of vertical industry needs and other spectrum challenges. It also identifies, when appropriate, the related ECC activities (such as Work Items (WI) in the ECC Work Programme) and the areas where further considerations are expected. 3.4 – 3.8 GHz: this band was already harmonised within Europe for Mobile/Fixed Communication Networks (MFCN) through ECC Decision(11)06. Activities have been carried out to review the harmonised technical conditions contained in this Decision to ensure their suitability for 5G. ECC Report 281 with proposed updates to the technical conditions was published in July 2018. The updates reflect the use of Active Antenna Systems (AAS) for 5G. ECC Decision(11)06 was updated accordingly in October 2018. ECC Report 287 was also published in October 2018, providing guidelines to help administrations in defragmenting the 3.4-3.8 GHz band, in which there are existing licences in many CEPT countries. Draft ECC Report 296, currently under public consultation, aims to provide guidance to administrations on the regulatory options for synchronisation in the band, in particular, to enable unsynchronised and semi-synchronised operation of MFCN. The draft Report is planned to be finalised in March 2019. 24.25-27.5 GHz: CEPT has identified the 26 GHz band for early European harmonisation, as it provides over 3 GHz of contiguous spectrum and more favourable propagation than the higher frequency bands under consideration. Compatibility and protection, as appropriate, with all existing services in the same and adjacent frequency bands, in particular the protection of existing and future EESS/SRS earth stations should be addressed. As a result, ECC PT1 developed ECC Decision (18)06 setting the harmonised conditions for the introduction of 5G in the 26 GHz band. The ECC Decision was adopted by ECC and published in July 2018. In addition, ECC PT1 has been tasked to develop "toolboxes" for national administrations to manage the coexistence of 5G with FS, with EESS/SRS and FSS Earth stations and also to consider regulatory options for synchronisation in the band. Draft ECC Recommendation (19)01 on coexistence with EESS/SRS earth stations is currently under public consultation, and is aimed to be finalised in March 2019. Other deliverables are planned for finalisation in July 2019. In December 2016, the European Commission issued a Mandate to CEPT to harmonise technical conditions for the development of EU-wide 5G equipment. The Mandate addresses the same bands identified in the CEPT roadmap (3.6 GHz and 26 GHz), so there is a link to the existing harmonisation activities within ECC PT1 as outlined above. ECC PT1 has developed 2 CEPT Reports ( CEPT Report 67 on 3.6 GHz and CEPT Report 68 on 26 GHz) on harmonisation measures. These Reports were sent to the EC in July 2018 and form the basis of ongoing considerations within the Radio Spectrum Committee for the development of relevant EC regulations in the 2 bands. 40 MHz of spectrum for supplementary downlink (SDL) for MFCN was previously harmonised in 1452-1492 MHz through ECC Decision(13)03. ECC PT1 recently developed a new ECC Decision(17)06 to additionally harmonise the surrounding frequency bands (1427-1452 MHz and 1492-1518 MHz) in order to provide a total of 89 MHz of contiguous harmonised spectrum for MFCN. Due to the fact that 5G envisages very high data rates, much larger bandwidths than ever before will be required (up to several GHz), which can only be found in higher frequency bands above 24 GHz. CEPT participated in the intensive debates on this issue during the preparations and in the course of WRC-15. The outcome of the Conference was a Resolution to focus on specific frequency bands, as proposed by CEPT, under agenda item 1.13 for WRC-19. ECC PT1 has been tasked with the responsibility of CEPT CPG preparation for this agenda item and has been undertaking studies in priority bands, and is progressing its work based on prioritisation defined in the CEPT 5G roadmap. ECC PT1 has participated in the relevant ITU-R activities in Task Group 5/1. The current usage of these bands and initial prioritisation for study were the subject of an ECC PT1 questionnaire in late 2016. A summary of the results of the questionnaire are available here. Identification of suitable bands needs to address compatibility with existing systems in the same and adjacent bands, and migration of existing usage if required. ECC PT1 has developed the draft CEPT Brief to propose IMT identification in these bands. 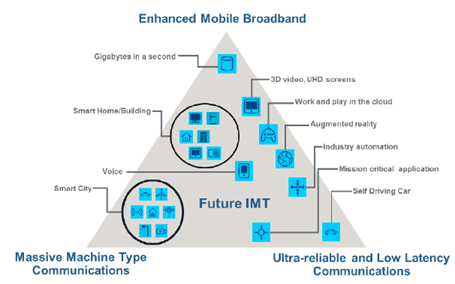 In addition, ECC PT1 is actively participating in ITU-R activities on IMT-2020/5G in WP 5D, which has been working on technical requirements and is now focussing on evaluation of 5G candidate technologies. The CEPT roadmap identified several actions addressing the requirements of vertical industries in the context of 5G (e.g. PPDR, industrial automation, automotive, utilities, rail, …). They are expected to be considered, as appropriate by ECC PT1 and WG FM in their related activities. The ECC plans to hold a workshop to discuss the requirements of vertical sectors on 2-3 May 2019. The roadmap also identified a need to take into consideration what satellite solutions can bring for 5G. PT FM44 developed ECC Report 280 on this issue in cooperation with ECC PT1. The Report was published in May 2018 and identifies the main use cases where satellite could play a role in 5G. Other issues, such as new sharing opportunities and challenges (e.g. MIMO), considerations on authorisation regimes, infrastructure and backhaul requirements for 5G will also need to be addressed. The ECC strategic plan, with additional guidance from the ECC Steering Group, tasked ECO to engage with relevant research activities focusing on 5G. In this context, ECO has agreed to participate in the advisory board of the COHERENT project. This is one of the H2020 5G-PPP projects funded by the European Commission, which aims to research, develop and showcase a unified programmable control framework for 5G heterogeneous radio access networks. The project ended in June 2018 and the main results are now available. In future cooperation will further be strengthened between ECC and 5G-PPP (through the LoU signed by ECC and 5G-IA) and between ECC and JRC. ECC has already harmonised more than 1200 MHz of spectrum for mobile broadband in the frequency range from 694 MHz to 3.8 GHz. Bands within this frequency range have been under study for almost 20 years with an aim to increase the availability of bands for mobile broadband. Relevant MFCN deliverables for frequency bands of interest can be viewed in this document, or by using the EFIS search function (select ‘MFCN’ under ‘level 2 application terms’). In the future, there may be a need to adapt the harmonised regulatory framework in these existing frequency bands to account for 5G (e.g. to accommodate the needs of networks based on small cells and Active Antenna Systems). In addition to the ongoing update of technical conditions in 3.4-3.8 GHz, ECC has tasked ECC PT1 to review the existing ECC Decisions for the 2.1 GHz (ECC Decision (06)01), the 2.6 GHz (ECC Decision (05)05) and the 900/1800 MHz (ECC Decision (06)13) bands. ECC PT1 has conducted technical analysis for the 900 and 1800 MHz bands in Draft ECC Report 297 and the 2.1 GHz band in Draft ECC Report 298. These reports are currently under public consultation, in parallel with corresponding draft revisions to ECC Decision (06)13 and ECC Decision (06)01. All of these deliverables are planned to be finalised in March 2019. Similar analysis for the 2.6 GHz band and an update to ECC Decision (05)05 is planned to be completed in June 2019. In September 2018 the EC issued a Mandate to CEPT to address similar updates to the relevant EC regulations in these bands. ECC PT1 has started work on the tasks of this Mandate and will finalise a first CEPT Report in June 2019 addressing the 2.1 GHz and 2.6 GHz bands, as well as initial information for the 900 and 1800 MHz bands. A more comprehensive review of the conditions in 900 MHz and 1800 MHz is planned for a second CEPT Report to be finalised in October 2020. ECC has agreed that the existing ECC Decisions on 700 MHz, 800 MHz and 1.5 GHz are already suitable for 5G since the technical conditions in these Decisions are technology neutral and there is no plan to implement Active Antenna Systems in these bands. On 2-4 November 2016 the ECC held a workshop to discuss 5G developments and requirements. The aim of the workshop was to establish CEPT’s priorities for 5G, taking into account views from all stakeholders, including international organisations, standardisation groups, mobile industry and vertical industry members. Views on ongoing 5G developments outside Europe were also introduced. In addition, ECC officials delivered recently presentations at different Conferences and events regarding the subject.